When I saw the octagonal sign hanging on the entryway that said, “STOP: Please Remove Your Shoes Before Entering,” I had a feeling I wasn’t in Cambridge anymore. I unzipped and hesitantly slid off my boots (slightly embarrassed about my fuzzy socks), and pushed open the doors to the gym on the fourth floor of the Malkin Athletic Center. Immediately, a cloud of students clad in what looked like floor-length purple skirts that read “NYU” walked by. Later, I learned that the skirt—a Hakama—is just one part of the whole Kendo uniform, designed to look like the apparel of a Samurai warrior. The gym was crowded, but it seemed that I was one of few unaffiliated spectators, and possibly the only person other than Harvard emergency medical technicians who wasn’t in kendo garb. I was at the Shoryuhai Intercollegiate Kendo Tournament, a Harvard-run Japanese sword fighting tournament and the largest collegiate tournament in the nation. Walking carefully so as not to tread on the bamboo swords or gym bags that were scattered around the bleachers, I climbed to the top row and settled down to watch the match that was about to begin. Two people wearing hakama skirts and white faceless masks circled each other in the middle of a large circle of spectators, their swords raised. Suddenly, there was shouting and the sound of swords clashing against each other; after nine or 10 seconds, there was excited applause and the circle began to disperse. I sat, clueless: What on earth had I just witnessed? A loudspeaker announcement informed me that it was time for lunch, so I wandered onto the gym floor to get a closer look. As far as I could tell, Harvard fighters were gathered in the farthest corner, set up with pizza and Dunkin’ Donuts and chatting about their morning. Walking up to the nearest people that looked like they might be on the Harvard team, I asked them about their experiences with Kendo sword fighting. 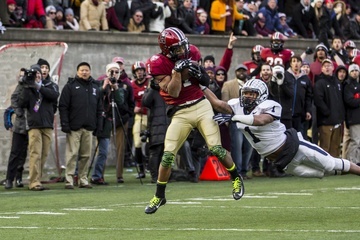 Jack F. Weyen ‘16, a member of the team, said the sport is oppositional. “Its all about the mentality of battle,” he said. “You shout to show intent and faith in attack, and then you hit.” According to Weyen, each spot you aim for is one that makes clear your desire to kill your opponent—the throat, wrist, torso, or head. These battles play out between groups of four or five people from each team, in a match lasting anywhere from 10 seconds to two minutes. 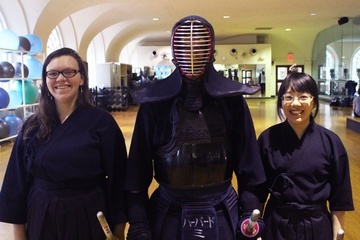 They end once an attacker gets two “touches.” The singles tournament is much more difficult than the team matches; although it requires less strategic thinking, players say, students face masters of kendo, “dons,” as well as alums and graduate students. Because many undergraduates are beginners, they rarely make it to the finals. Parker’s team members agreed, rolling up their sleeves to expose bruises and welts on their arms from recent matches. As proud as its players were, however, the Harvard Kendo team’s day was already over. No Harvard students had made it to the next round of singles, although Co-Captain Aidan C. de Burgh Daly ’13 had beat NYU during the group matches, pulling through against an opponent many assumed was better than Harvard. The team dispersed to get lunch, and I wandered back through the gym, intrigued—struck, even?—by a slice of this subculture.